Last month, BI Intelligence created a 22-question survey and distributed it to the entire Business Insider website, which attracts roughly 50 million unique visits each month. Based on the pool of 2,107 respondents — the vast majority (95%) of whom own smartphones — nearly half said they planned on buying a phone in the next six months, and the majority of those people (55%) said they planned on buying a new Apple iPhone. 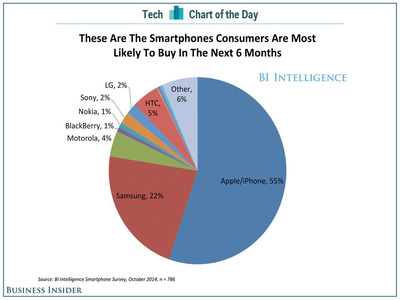 After Apple was Samsung, which attracted about 22% of intended smartphone purchases. There’s a ton of other interesting tidbits from BI Intelligence’s analysis of the survey. For instance, one-third of future iPhone buyers said they wanted to buy the iPhone 6 Plus, and somewhat surprisingly, the price of the phone was a non-issue for the vast majority of respondents, regardless of region or income. To learn more about the survey, visit BI Intelligence.